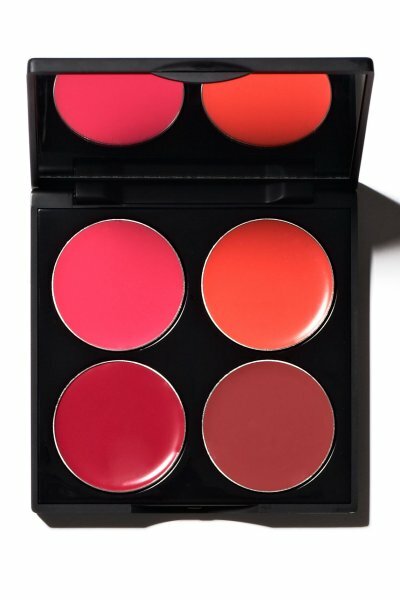 Are you drooling yet over these four amazing colors for lips AND cheeks (and only $15)? Sonia Kashuk has another Target exclusive winner with the A Kiss on the Cheek Lip and Cheek Palette. A collection of four gel/cream lip and cheek tints housed in a skim, snap-shut case with mirror. Each and every one of the colors is perfect for brightening up both the skin and lips. The four shades are (from top left to right, pictured above) pink, coral, berry and deep rose. I loved blending the pink and coral together for lip and cheek looks, and the deep rose provided the perfect "your lips but better" shade for me. These can be used with fingers, a brush or blending sponge. The colors are extremely pigmented and smooth, soft and creamy. They just melted into my skin/lips leaving beautiful color throughout the day. For lips, these work on their own and are very soft and hydrating, but they can also be paired with a gloss if desired. The colors can be sheered out for a subtle stain on the lips, or applied with a lip brush for a very strong, defined mouth. When using on the cheeks, for best results, warm them up a bit on the back of your hand first and then apply with a brush or fingers. The finish on the cheeks is soft and slightly dewy and provide a really, nice healthy glow to the skin. For the lips it's semi matte and non-sticky.